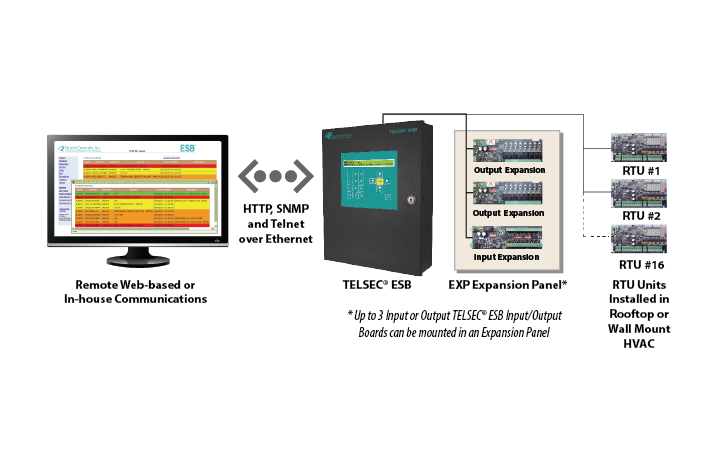 The TELSEC ESBx incorporates all the benefits of the standard TELSEC ESB, plus allows custom configuration to house two expansion boards in the same enclosure to reduce space and installation time. 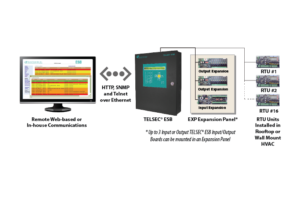 TCP/IP over Ethernet Connectivity. Supports SNMP v1, SNMP v2c. 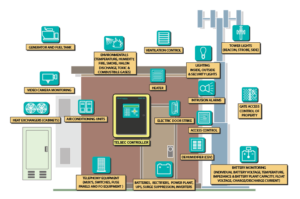 Expandable to 128 universal inputs, 64 digital outputs and 10 analog outputs plus 16 stand alone RTU HVAC controllers. Controls multiple air conditioning units for fan, cooling, heat, and economizer through optional Intelligent Roof Top Unit Stand Alone Controllers. Supports polling and alarming of 512 registers for Modbus RTU slave modules. Converts Modbus RTU data to SNMP for remote polling and alarming of devices. Non-volatile FLASH memory prevents program loss & stores program upgrades. Monitors all environmental alarms: temperature, humidity, fire/smoke, toxic & combustible gas, high water. Built-in RS-232 communications port for on-site monitoring and programming. Built-in 2 line, 40 character LCD display and 18 button keypad for system status and setpoint changes. Card access control of up to 4 doors with 600 cards per system, logging last 800 entries plus Intrusion Monitoring.